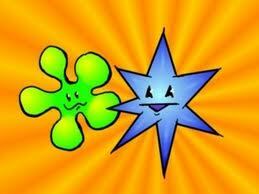 Bouba and Kiki is a linguistic experiment in which participants are presented with a curvy shape, and a spiky shape. They are told that one is named “Bouba” and one is named “Kiki,” and then asked to guess which name belongs to which shape. Consistently 90 + % of respondents say that the curvy shape is Bouba and the spiky shape is Kiki. This experiment has been done in different languages (I even tried it with some school teachers in Japan this summer), and replicated with the same results over and over. The implication is that we have hardwired associations between phonemes and meaning. Which in turn, means to me that even if a poem is made entirely of phonemes, and there is no syntantic meaning, there still exists an undercurrent of meaning (albeit associative and connotative).